Grand Rivers is a charming resort village located about 20 miles east of Paducah. 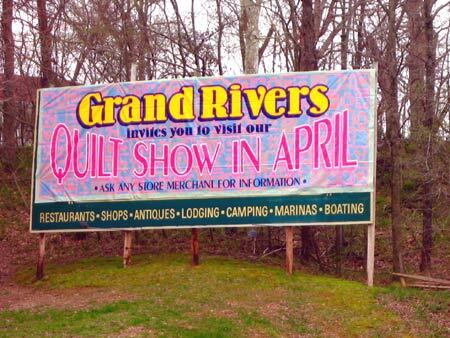 Located between Lake Barkley and Kentucky Lake at the north end of the Land Between the Lakes National Recreation Area, it is an especially popular destination during Paducah's AQS Quilt Show. The village has a number of attractions and in addition they host their own Quilt Show & Spring Festival the last weekend in April to coincide with the "Big Quilt Show" in Paducah. Patti's is a village-within-a-village, a re-created historical log cabin community, complete with a fine restaurant, acres of gardens, several artisan shops, a mini-zoo, a wedding chapel, a cafe-coffee shop, a miniature golf course, a sailing pond and more. < < < The Water Wheel is next to Anna's Garden Cafe & Coffee House. < < < In foreground, part of the children's zoo; in the background, the Wedding Chapel. While overall the restaurant can handle hundreds of guests, numerous small dining rooms create an intimate atmosphere. The ambience is enhanced by antique hardwood chairs and tables as well as memorabilia hanging on the walls and from the ceiling. See our Patti's Settlement restaurant review. Grand Rivers has a collection of unique gift shops, artisan shops, antique stores. They also have the Badgett Playhouse with a regular schedule of music and variety shows, plus educational plays and movies. < < < The entrance to the Canal Campground Recreation Area, a popular RV park at the edge of Grand Rivers.